We hold enough competence to fabricate flawless 11.1 V 20800MAH Li-Ion Battery Pack (Li111208C5) and make it obtainable to various parts of the globe in a time-efficient manner. 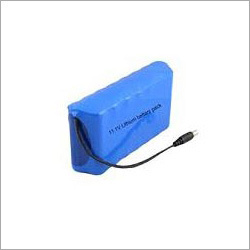 We are counted among the chief Manufacturers, Exporters, and Suppliers of 11.1 V 20800MAH Li-Ion Battery Pack (Li111208C5) from Delhi, India. We fabricate it from premium components and materials, in accordance with the quality standards. And the battery is made available in varying sizes, designs, and loaded with desirable set of features, as per the clientâs requirements.